Plant operators rely on plant air pressures to maintain properly working equipment and systems. One of the most common problems affecting processing plants that utilize compressed air systems is the ability to maintain reliable air pressure throughout the distribution system. Insufficient air pressures may be due to undersized distribution piping, but it’s more commonly found that the cause is flow restrictions in the distribution system such as filters, check valves, and fittings, as well as flow meters and gauges. Leaks in the distribution system actually rank low as the common cause of “pressure drop”. Pressure drop is the loss or reduction of pressure from the compressor discharge to the actual point of use. The system will appear like there is a lack of air pressure but the real problem is pressure drop, which will cause excessive energy consumption. 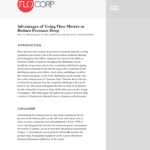 This white paper will explain the causes of pressure drop, a variety of solutions and ultimately how to eliminate costly downtime. 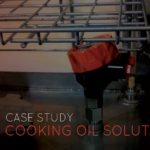 Unfortunately, the solution is not as easy as just cranking up the air pressure at the delivery point, as this will cause other issues such as leaks, excessive component wear and maintenance. Every 1 PSI of excess operating pressure increases air compressor power consumption by around 0.5 percent. As can be seen from the pressure drop formula in figure 1, increasing the system pressure will actually increase the pressure drop. Unregulated equipment on the system will increase demand and increase inefficiency of the system. Minimizing pressure drop can be obtained by selecting equipment such as air treatment equipment, filters, dryers, flow metering and instrumentation with the lowest amount of pressure drop. Additional ways to decrease pressure drop would be to maintain air filtering and air treatment to reduce moisture that can create corrosion and increase friction on the piping system. Also, reduce the distance the air travels through the distribution system so as to create the shortest runs possible to reduce loss. Select the correct pipe sizes and pipe material with the effort to stay away from hoses or corrugated products that will reduce pressure. Sizing pipe is critical for efficiency with the goal of keeping air velocities in the distribution header less than 20 to 30 ft./sec. Increased velocities will increase pressure drop. the pressure expected at its outlet valve. Thermal Mass flow meters are also an excellent choice for measuring flow in the compressed air line as long as the meter is installed after the air dryer and the air dryer is functioning properly. Thermal Mass meters will typically measure a flow range of 100:1 so they can read very low flow rates which enable detection of air leaks in the system. Some Thermal Mass meters, such as the FLO-CORP CalFlo™ flow meter, will insert into the pipe and even have hot-tap ability for easy installation without shutting the system flow down for installation. 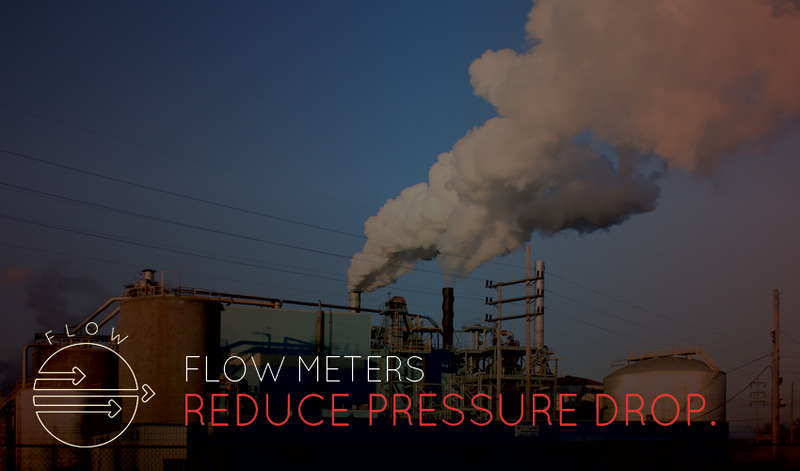 Since there are no moving parts, the meters are easy to maintain, and the flow system, when inserted into the pipe, will provide accurate flow with almost no pressure drop across the flow meter. Insertion type thermal mass flow meters can also be used as a portable meter that can measure flows at many different locations by insertion through isolation ports installed throughout the system. The meters will detect velocities well over 30 fps and as low as 0.05 fps. When smart metering is implemented, the system optimizes velocity and operating pressure to reduce pressure drop. Typically, a flow meter is used to measure plant demand and not the full load of the compressor output. The baseline of the operating system can be generated with flow, pressure and electrical load measurements taken on a continual bases through customized meters like FLO-CORP’s CONNEX 3D™ flexible process meter. This flexible process meter will calculate the baseline with time and date stamped data that is stored in the memory of the unit. The data can also interface with a PC based monitoring software for use when analyzing data during production or when flow data analysis is convenient. Some benefits to utilizing a flexible process meter is that leaks can be easily detected. This happens when the flow reading is indicating something besides zero flow when the plant is not in operation. The pressure trend will also indicate a loss of pressure at a greater rate than historically trended if the air leak(s) have increased over time. Logged data can also be analyzed to evaluate system performance and provide predictive maintenance on the compressor head, vanes and lower unit to prevent loss of pressure. It is possible for the compressor to consume the same amount of energy and even appear to be working properly but not produce any pressure or air flow. These operational and maintenance issues can be reduced by smart metering analytics and system alarming strategies.